When BJP President Rajnath Singh announced the name of Narendra Modi’s name as the PM candidate, he would not have imagined himself defending Modi, just two months after, on serious allegations of “stalking”. But politics is the art of the possible. Politics surprises you. Rajnath Singh has been Modi’s best friend, ever since party patriarch L K Advani resigned during party’s National Executive, in June this year, and later retracted. Allegations of snooping and stalking, on an aspiring PM candidate at such an early stage of campaigning depicts a sorry picture for the BJP. The BJP which has been out of power since a decade, and is ruling only 4 states on its own in India needs a better campaign start than this. In the current political landscape, BJP is so smug about the so called “Modi –wave” that it has chosen the party President to reply to the stalking allegations by its “Saheb”. 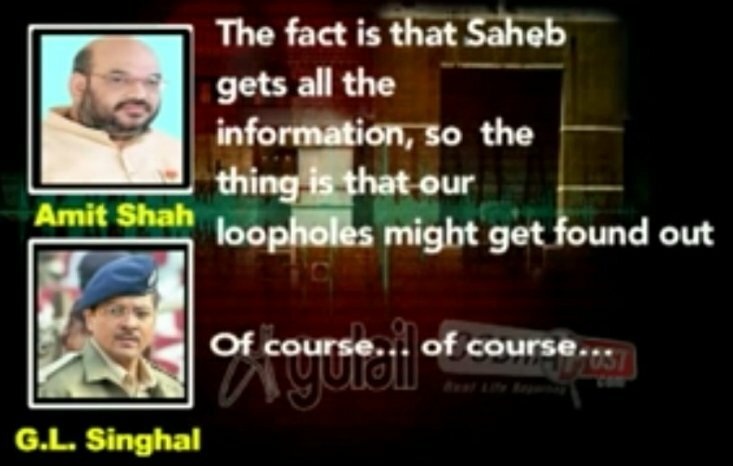 The Cobrapost-Gulail expose raised certain important questions to the Gujarat government. However, the Gujarat government has gone completely mute, and has left the central leadership (read: Rajanath Singh) to do the fire fighting. The two protagonists of the tape- Gujarat Home Minister Amit Shah, and “Saheb” Narendra Modi are conspicuous of their silence. The mainstream media is busy chasing Shah, who is looking touring the politically crucial state of Uttar Pradesh, but not a syllable has been uttered by Shah in this context. Strangely, Leader of Opposition Sushma Swaraj’s stand on the issue further testifies, how broken the BJP house is. Sushma Swaraj in an interview to a TV channel welcomed a CBI probe into the snooping-stalking row. The BJP’s defence on the issue has been far from satisfactory. BJP spokesperson Nirmala Sitharaman, has made the entire debate simplistic by tweeting about emergency and bugging in those days in order to defend Modi. In a desperate attempt to retaliate, she even tweeted an old story about Congress Vice President Rahul Gandhi on which has already been trashed by the Supreme Court. She later talks about the excesses committed during emergency, at a TV show. This has exposed the hollowness of BJP’s defence. They have absolutely no answers on some of the simple questions raised by the tape. They have produced two letters, one in which the young women’s father claims that he had asked the CM of Gujarat to “protect his daughter”. The father claims that since the CM was a “family friend”, he had asked his help. This letter is without any address, any contact numbers and has been circulated by the BJP. This letter has specific credentials, except that-it makes it a bit easier for the BJP to make it a private versus public debate. The second letter produced days after the Cobrapost-Gulail expose in which the young women who was snooped by the three most important security agencies of the state, tells, that she asked her father to do so. Again there are no credentials in the fresh letter too. It is certainly a public debate. Public authorities, public institutions, public exchequer is involved in surveillance of a young women, round the clock. Your money is involved, my money is involved. Therefore the BJP’s argument about it being a “Private case” falls flat. 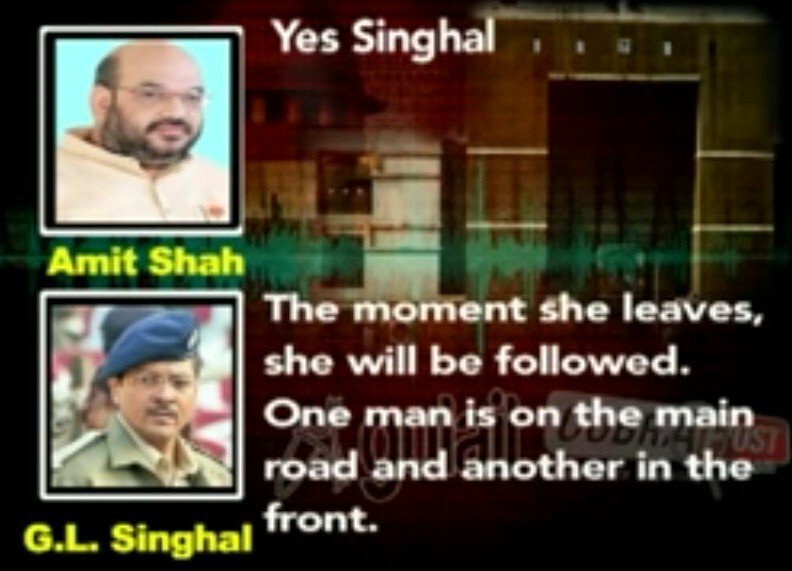 The mere fact that public personals and public institutions were involved in surveillance of the girl and the state Home Minister was monitoring each and every movement of the girl and reporting it to his “Saheb” miserabely punctures BJP’s defence that it was an “Internal family affair”. In addition to that, there are several other questions which Amit Shah and Narendra Modi should answer. 1) So far, neither the BJP nor any of its “Sahebs” have denied any snooping. Infact, the BJP has accepted that Saheb is Narendra Modi himself by releasing these letters. 2) Why and how were three key wings of the Gujarat Police—the State Intelligence Bureau, also known as CID Intelligence, the Crime Branch and the Anti-Terrorist Squad involved in stalking only one woman? 3) As per reports, there are more than 2500 people in Gujarat who have applied for security on various grounds, what about their security? Why such massive use of public institutions for just one person? 4) Content of the tape reveals that Saheb (Narendra Modi) was also conducting surveillance of these young women from his own independent sources, over and above the use of State police officers. Would either of them answer what are these extra-constitutional methods of snooping? 5) The most important question is – Why is BJP dead silent on police officer GL Singhal’s statement and IAS officer Pradeep Sharma’s petition in the High Court which establishes that this was the same women who was kept under watch by Shah and Co.
Apart from these, several other questions about Privacy issues, “Right to Life”, misuse of Telegraph Act and degrading public institutions have come up, which have got ample media space. The snooping row also has deep connections with the fake encounter cases in Gujarat, specially the Ishrat Jahan case. IPS officer GL confessed to have played a part in planting arms on the person of Ishrat Jahan and three others. He also disclosed that D.G. Vanzara had told him that the killings of Ishrat Jahan and her associates were cleared by “safed” and “kali” dadhis, the alleged code names that Vanzara had, respectively, for Modi and Shah—a charge which has to be proved in a court of law. Neither the Modi government, nor the BJP had any pertinent defence in the Vanzara expose about the Tulsiram Prajapati fake encounter case, nor do have any defence now. Extraordinarily, more than a dozen senior police officers in Gujarat are in jail or facing prosecution, in connection with cold-blooded murders dressed up as encounter deaths. Gujarat saw 21 encounter killings between October 2002 and December 2006. The BJP, which made a hue and cry about Arun Jaitley’s phone tapping row, and stalled Parliament for 3 days has gone silent, and so has their PM candidate. This entry was tagged Amit Shah, BJP, Cobrapost, Congress, India, Narendra Modi, Rahul Gandhi. Bookmark the permalink.